For the Rice family’s front yard Betsy Schulz turned a steep sandy slope into usable outdoor living space. 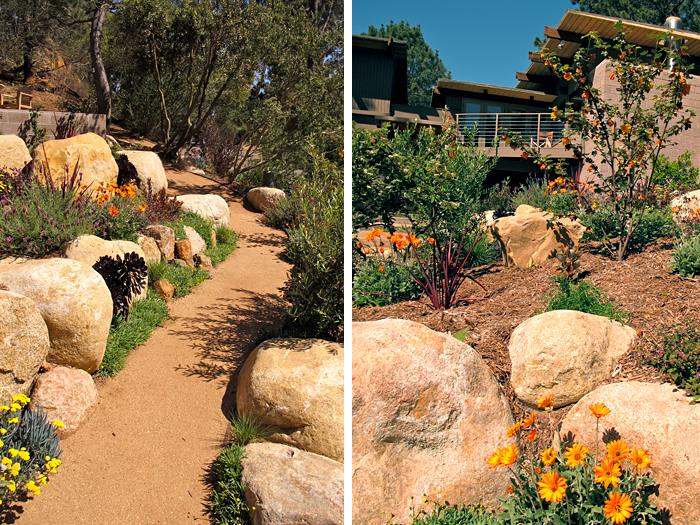 To do this, she designed terraces with boulders and concrete retaining walls. The walls were built using ground face block that matches the house block and contributes to a modern look. All the new plants are native and low-water varieties, in keeping with the vegetation of the nearby Torrey Pines State Natural Reserve Annex. An area for a kitchen garden allows the family to enjoy fresh home-grown produce.